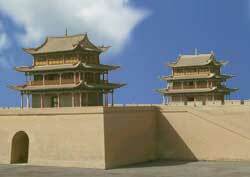 The remote Ming Dynasty Jiayuguan fort was the last and farthest west of the Ming Dynasty Great Wall outposts. It successfully guarded the strategic Jiayuguan Pass for centuries. It commands a narrow critical mountain pass which was a tempting route for an ancient invading army. And, because the Silk Road went through the pass, Jiayuguan was a logical place to collect duties from the caravans. This icon of China stretched out from both sides of the fortress. If you wanted to enter China's heartland, you had to travel through the fort, in one guarded gate and out the other. The Jiayuguan bastion has a formidable (yet elegant) design. Its walls are 10 meters (33 feet) high and exceptionally thick. The bastion's solid construction and intelligent military layout inspired ancients to proudly call Jiayuguan "The strongest pass under heaven".